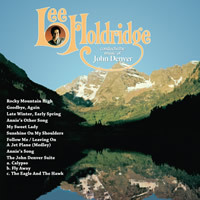 BUYSOUNDTRAX Records presents LEE HOLDRIDGE CONDUCTS THE MUSIC OF JOHN DENVER. The album features musical arrangements of the music of singer/songwriter John Denver, conducted by Lee Holdridge. John Denver and Lee Holdridge enjoyed a long collaboration together, beginning in 1974 with Denver’s album, Back Home Again. Similar to his relationship with singer/songwriter Neil Diamond, Holdridge frequently wrote the musical arrangements for the songs on Denver’s albums. Originally recorded in 1975, this album was inspired by one of Lee Holdridge’s violin concertos and contains arrangements of some of John Denver’s best known songs, including Rocky Mountain High, Annie’s Song, Sunshine On My Shoulders and others, including Calypso. Released on vinyl in 1975, fans of John Denver have often written the composer with requests to release this special album on compact disc. John Denver was born in Roswell, New Mexico in 1943. He fell in love with music at an early age when he received his first guitar at age 12. Self-taught, he was good enough to perform at local clubs by the time he was in college. He received his first taste of success in 1969 after releasing his first album, Rhymes And Reasons. While the album was not a big success, his song “Leaving On A Jet Airplane” had been covered by Peter, Paul and Mary two years prior and when people discovered that he was the original author, doors began to open for him. Denver’s commercial breakthrough came with the song “Take Me Home, Country Roads” from his album, Poems, Prayers and Promises, which rose to number two on the Billboard charts. Denver’s career flourished from then on, with a series of hit songs over the next four years. Also key to Denver’s success was his many early appearances on television, which endeared himself to people from all walks of life, due to his affable manner and his happy, positive image. In 1975, he was awarded the Country Music Association’s Entertainer Of The Year award. In addition to his music career, Denver also enjoyed success at the box office in 1977, starring opposite George Burns in Oh, God! Denver was also a guest on the Muppet Show, which began a life-long friendship with creator Jim Henson, and continued with television specials and records. Sadly, John Denver’s life was cut short by an aviation accident in 1997. Lee Holdridge was born in Port-au-Prince, Haiti in 1944. He spent his early years in Costa Rica, beginning music studies on the violin at the age of ten with Hugo Mariani, then the conductor of the National Symphony Orchestra of Costa Rica. Later, Holdridge moved to New York to continue his music studies and begin his professional career as a composer. Holdridge’s successes in New York came to the attention of Neil Diamond who brought Holdridge to Los Angeles to write arrangements for his forthcoming albums. A string of Gold and Platinum hits followed, which led to Diamond and Holdridge collaborating on the film score for Jonathan Livingston Seagull. Since that time, Holdridge has scored numerous film such as Splash, Big Business, Mr. Mom, Micki & Maude, 16 Days Of Glory, The Beastmaster, Sylvester, A Tigers’ Tale, El Pueblo Del Sol, Old Gringo and Pastime. His television work includes Moonlighting, Beauty and the Beast, the complete eight hour remake of East of Eden, The Tenth Man, Dreamer of Oz, Hallmark Hall Of Fame’s One Against the Wind and The Story Lady. Lee also began a very successful collaboration with Moriah Films, the film division of the Simon Wiesenthal Center, with the Academy Award winning documentary feature film The Long Way Home. In addition to his film career, Mr. Holdridge has had an extensive repertoire of concert works performed and recorded. He has also worked with many major recording artists having written, arranged and conducted for Placido Domingo, Barbra Streisand, Brian May of Queen, Stevie Wonder, Neil Diamond, John Denver, Neil Sedaka, Daniel Rodriguez, Al Jarreau, Dionne Warwick, Diana Ross, Natalie Cole, Jane Oliver and many others. BUYSOUNDTRAX Records presents LEE HOLDRIDGE CONDUCTS JOHN DENVER, featuring musical arrangements of the music of singer/songwriter John Denver, conducted by Lee Holdridge in memory of the great John Denver. The first 100 copies will be autographed by composer Lee Holdridge.